Unseen 80’s starring Bruce Campbell. I’ve never actually seen a Bill Lustig film. What? Yes. It’s all true. 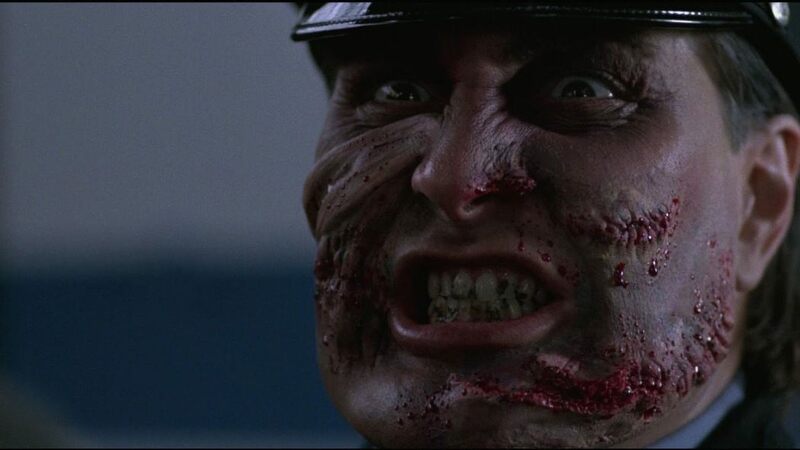 I’ve intended to watch Maniac Cop and Maniac in the same way that I tell the dentist, “Yeah, I’ll definitely floss every day.” Which is to say, good intentions and empty promises because distractions like watching Army of Darkness for the 37th time. I had this one prepped in my Netflix DVD Queue as soon as I read The Cinemonster’s Hooptober 5 requirements. I would finally end my Lustig ignorance. A massive fellow in a police officer’s uniform is crushing throats in New York City — this leads the jumpy public to start shooting the boys in blue at first sight. When Officer Bruce Campbell’s wife turns up dead, he’s suspect numero uno and must solve the case to save himself. In a parallel universe I could have been a poet or an unlikely rapper. It’s also the most interesting thing I’ll have to say about Maniac Cop. This is good for 31 Days of Horror writing progress, but bad for readership. (I am many days behind schedule and the notion of churning out more than one of these per day makes me wonder where I’m going to find the minutes.) It’s not that I don’t have positive things to say, just that I’m not all that enthusiastic or emotional about any particular observation. 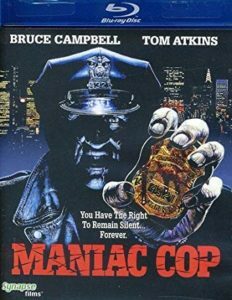 Maniac Cop is not a straightforward A-B-C slasher-type film. It reveals its killer without showing his face. I’m not suggesting that’s a negative — in fact — knowing (but without really knowing) the identity of the killer makes the film more interesting than had Lustig tried to hide his identity. Plus, more Robert Z’Dar is usually a good thing for your movie. Z’Dar, as a real life Golem, always adds a unique, monstrous element that can’t be duplicated with makeup or prosthetics. He’s a frightening mountain of a human. When you show the shadow of your human mountain — even if you don’t show his face — it can only be Robert Z’Dar. In this slightly unorthodox narrative, Lustig shows himself to be in control of the narrative and unusual pacing of Larry Cohen’s unwieldy script. 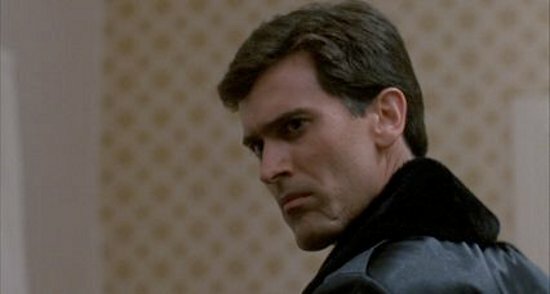 He sets up his low-budget horror movie with a series of rapid-fire kills to establish menace and then dials it back as he develops some protagonists in Tom Atkins’ detective and Bruce Campbell’s chin. It’s mostly effective, if not frightening or titillating or basically sensical. 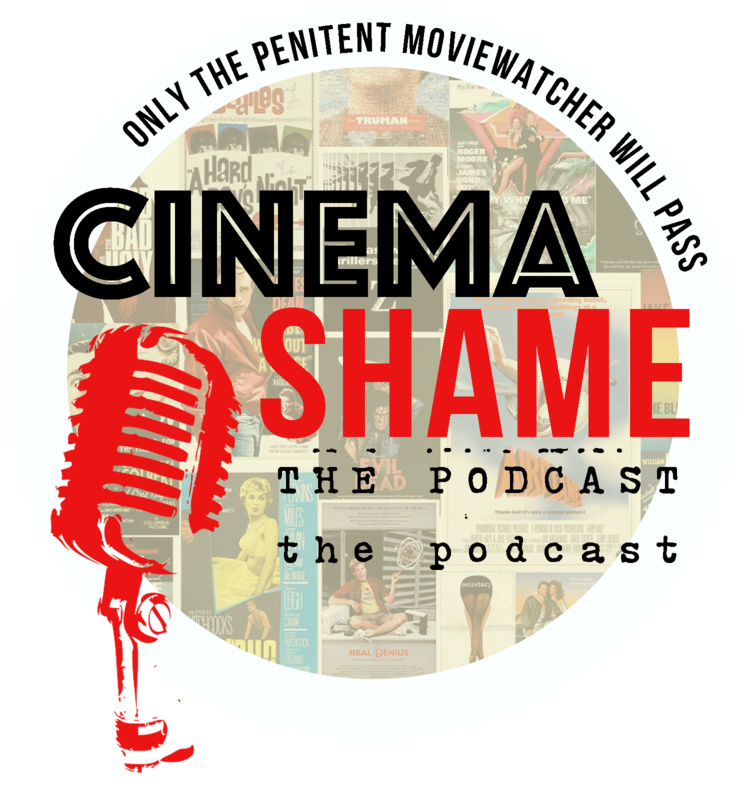 What he does well is suggest some effective social commentary not often found in your average cheapy horror outing. 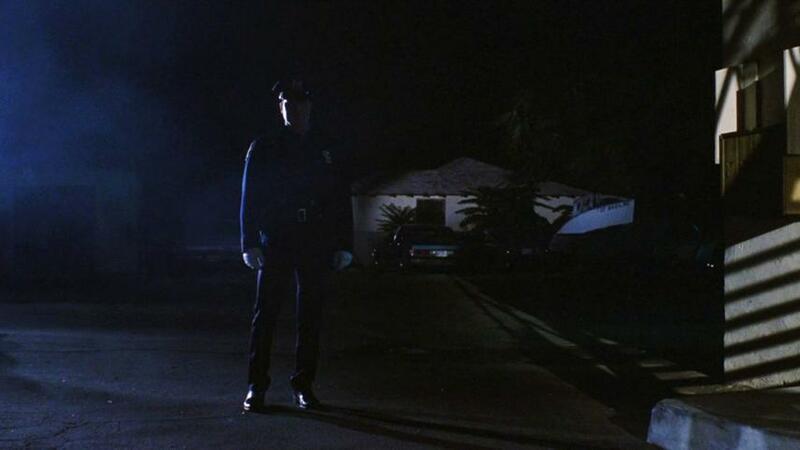 As a result I appreciated Maniac Cop more than I loved it. I found some toss-away stuff to enjoy, if little to love. It’s half slasher, half police procedural and quarter melodrama. (You do the math.) A lack of tonal consistency doesn’t have to be a negative, but in a film as succinct as Maniac Cop the runtime deficiency necessitates greater focus. A sub-90 minute slasher / police procedural / social satire / comedy sounds like a kitchen-sink first draft rather than a feature film. Rather than an ebb and flow of genre convention, Lustig offers heart-attack EKG. 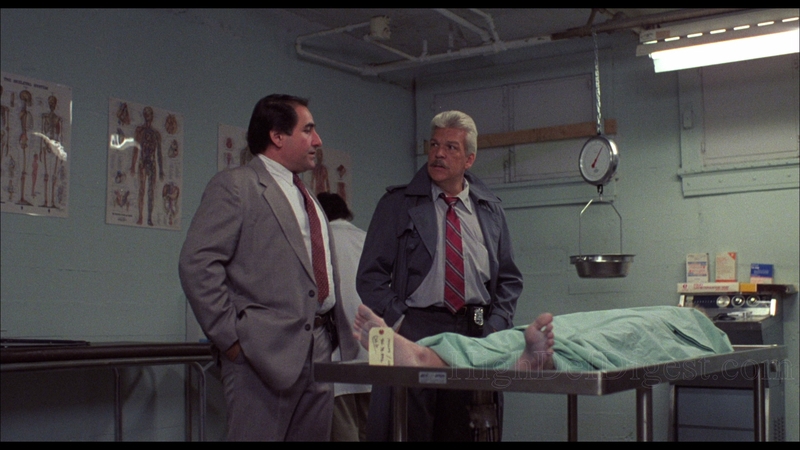 Maniac Cop was just missing a little extras sauce to make these disparate elements come together. And maybe therein lies the pitfall of knowing a film without actually knowing it. 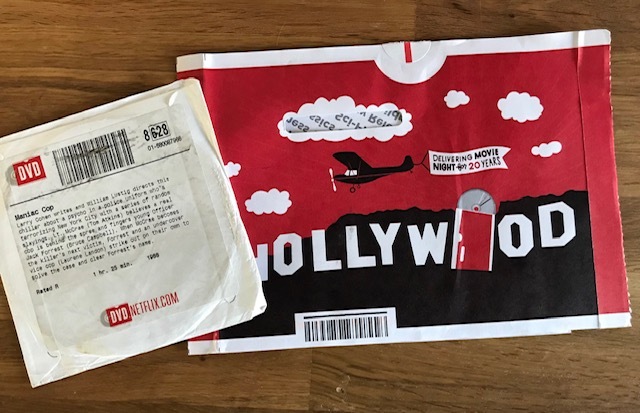 I expected more gore and more exploitation elements due to Lustig’s reputation but also because of word of mouth. I’m actually a little surprised it’s received this much attention as a cult film. The gritty New York City streets and real life struggle of a population seemingly at the mercy their police force. The cloaked visage of Frankenstein (yes, the monster not the Dr. — you try making that possessive flow in the context of your paragraph). The killer with a logical motivation and grueling backstory. The final Hal Needham-esque stunt. 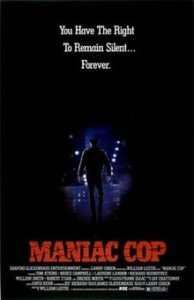 All of these elements provide memorable moments and images, but Maniac Cop amounts to a lark, a slice of 1980’s horror that mostly entertains and then disappears into the shadows of the more frightening, gory, and riotous films of the era. Worth a watch, but reserve some of your expectations. I’m also told that the sequel will deliver more of what I expected out of Maniac Cop. This promise gives me hope. I’m always in the mood for the opportunity to champion a sequel over an original because I grow oh so tired of the “Godfather II is the only sequel to surpass the original” argument. Not only because I disagree, goddammit, but because the horror genre is rife with examples of exemplary sequels that a certain segment of misguided movie fans write off as irrelevant schlock. It might be easy to make and sell a cheapy horror movie to horror fans (because they will literally pay to see garbage, no offense, everybody) — but that doesn’t make it any easier to make a competent, entertaining fright film. In the end, all these great ideas still have to come together. Synapse Films has had the decency to release Maniac Cop and Maniac Cop 2 on Blu-ray. It’s actually quite remarkable how good this movie looks considering the budget and era in which it was filmed. Credit goes to cinematographers James Lemmo and Vincent J. Rabbe. Considering I didn’t give them any love in the above blurb, we’ll toss them a mention here in hopes that people are still reading. Good on ya, James and Vincent. It might be too dark overall, but too-dark cinematography hides many ills.